With the promise of good soaring day we saw 16 plus members at the morning briefing. FUY, GAM and the 3 single seaters were enthusiastically taken to the west end of the airfield with expectations of the “murk” clearing by late morning. Wrong!! Oh aren`t we all the eternal optimistic bunch of aviators! The haze lingered most of the day with an improved visibility about 15.00hrs. As the first glider was launched just after 11.00am it was ruled one glider in the air at one time till about 14.30 when visibility improved and the first soaring began. Two soaring flights of 44 mins in the Puchaz and Alec in LPM just over an hour launched at 16.00hrs landing at 17.04. Many thanks to Mike J and Phil G for volunteering their time for instruction, Dave, Andy H, Nick M our intrepid winchers, Gordon and Stuart our volunteer tug pilots. Author chrischappellPosted on 11th April 2019 3 Comments on Guess who flew over the bollard backwards? 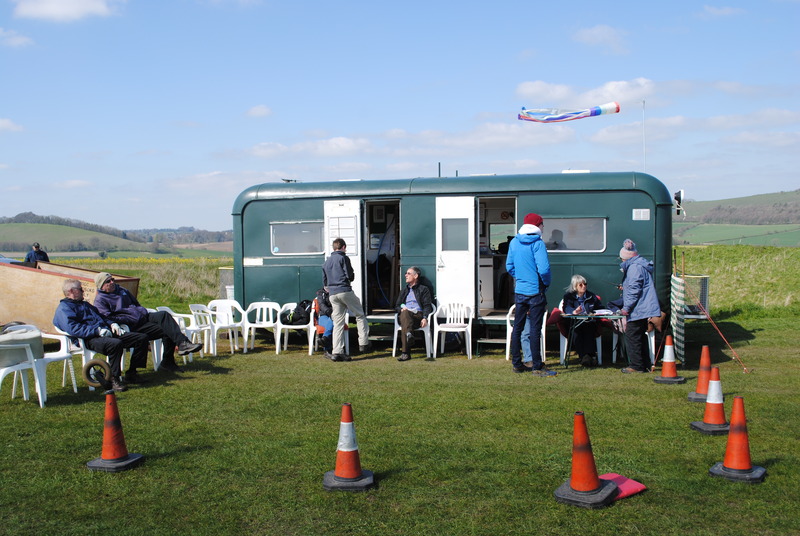 A very cold Wednesday morning saw some 18 club members turn out to fly during the day, amongst our usual maintenance team and “fettlers” of gliders. Two of our industrious private owners transformed the club Astir trailer from a greenish hue of accumulated alga to a very respectable white (ish), so all smart and ready for the first x-country retrieve. 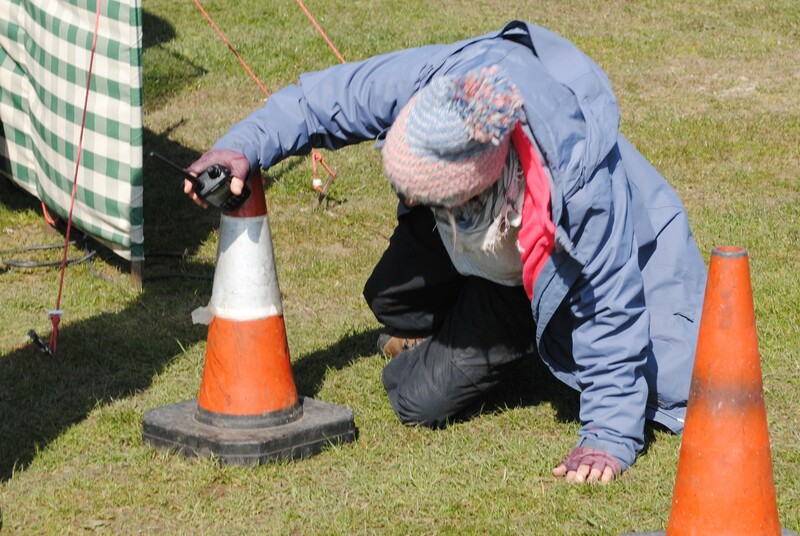 Just goes to show there are always plenty of non-technical jobs for our junior and cadet members to get involved with! First launch at 11.08 and final launch at 16.46. As predicted the grey, overcast sky cleared about 13.00hrs and soaring flights of up to nearly 2 hours with cloud base at around 3,000ft. With 1 Puchaz, K21, JKW, LPM and a couple of private gliders saw members enjoying soaring, having annual checks and regular instruction from Mike J and Alisatir with John Garland stepping in for the last check flight enabling our CFI to fly JKW and have some “me” time soaring away in the blue (but thermic) yonder! 28 winch launches, 2 aero-tows and 2 motor glider launches. True to British weather, after basking in the sun on Saturday and Monday, it definitely was back to the winter wear, with Alistair taking the photos of enthusiastic members taking advantage of the short window of thermal activity in the morning. First launch at 11.20 and final launch at 14.25, 13 winch launches and 6.38hrs. flying time. With some private gliders rigged, two Puchaz and LPM out on the field, longest flight of the morning 1.52hr. before the rain closed in. 17 winch launches produced 19.33 hours of flying time. Sun, thermals and soaring! What a glorious Wednesday which saw members enjoying soaring flights of up to just over 3 hours with a cloud base of 3,000ft plus with some good cross country tasks. With a good cloud base enabling members under instruction to gain some of their spinning and stalling exercise experience whist the tug is out of action. The day produced thermal activity till the close of day with the final launch at 16.11. First launch at 10.55. 17 winch launches in all. With a full fleet plus an extra glider – EZE, to tuck up for the night we were all witness to the amazing hanger packing skills of Nick B. With overcast sky and low cloud any possibility of flying was relegated to the afternoon. There was no shortage of jobs for members to get our community spirit well and truly working overtime, with EZE to be rigged, garden furniture to be spruced up and painted – ready for us all to sit in the sun after a good days flying, with a refreshing glass of something to chill out with. Maintenance crew as busy as ever. We welcomed new member Gotthelf Wiederman who got stuck in with jobs. Not to mention the “fettling” of private gliders as well. Lunchtime saw the club room almost “standing room only” with club members enjoying lunch and chit chat about all manner of things. Somewhere about 13.50hrs Mike J announced that we were getting the aircraft out if anyone wished to fly- have you ever been in a room and it`s suddenly gone from a loud hub of multiple conversations to no sound at all – you could hear a church mouse or a pin drop!! Members duly put their hands up and a Puchaz and EZE were out on the field, first winch launch at 14.20 and last at 16.52. With the 2 Mikes and Alistair instructing, check flights and flying with members who just wanted to get their feet off the ground. Many thanks to Andy, wincher for today and Chris B for LPC. 13 Winch launches in all to-day with Mondays 5 winch launches, saw 18 winch launches for this session of midweek flying. Great team effort to-day despite the forecast. Stuart and Chris Teasdale took the first winch launch at 9.59 precisely! The first half price launch for sometime. With the two Puchaz on the airfield by 9.40, briefing done, all who wanted a flight, flew before the weather closed in, albeit the cloud base being approx. 1,000ft and subsequently lowering itself, prompting us and flying machines to return to the club house and hanger retrospectively at lunch time! On the “Radar” for the new bookable system!! Is the now, established midweek flying going to become bookable the same as the weekends? With the new bookable system soon to be introduced at the weekends is the flexibility of “flying the weather midweek” going to be a thing of the past? It was not ruled out at the briefing of midweek flying this week. As in this months Glide Angle, mentioned by the ED, to which I also agree, the very mention of this possibility needs to be lobbied by club members who prefer the existing systems of club operations for midweek flying which generate plenty of extra volunteering and camaraderie whilst it brings about additional flying opportunities to club members and extra finances to our club. Author chrischappellPosted on 15th February 2019 1 Comment on On the “Radar” for the new bookable system!! Author chrischappellPosted on 7th February 2019 7th February 2019 1 Comment on FUY airborne.